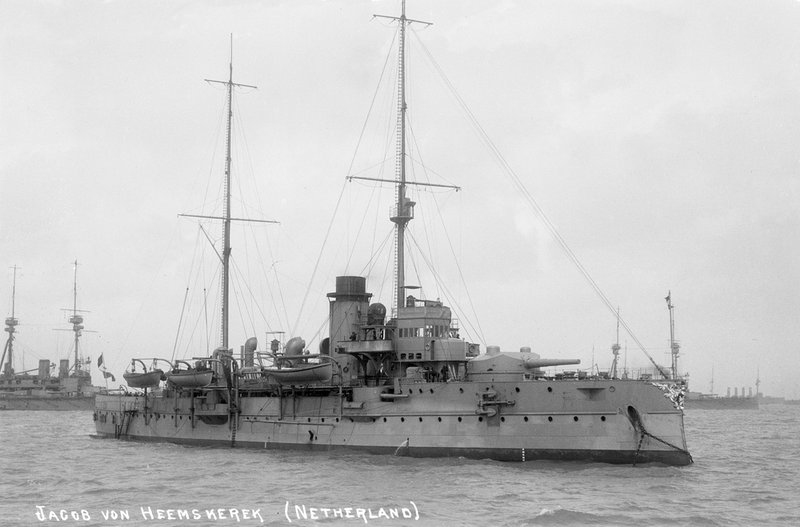 HNLMS Jacob van Heemskerck was a coastal defence ship (or simply pantserschip in Dutch) in the Royal Netherlands Navy / Koninklijke Marine. 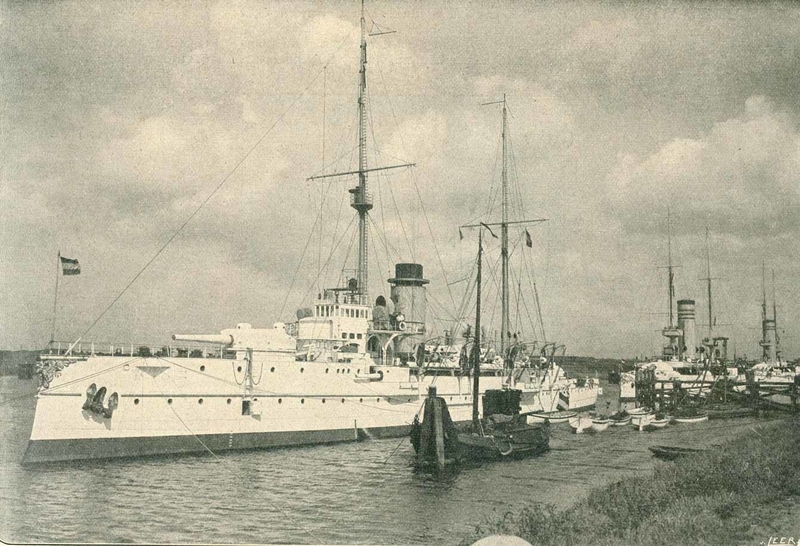 Laid down at Rijkswerf, Amsterdam in 1905. 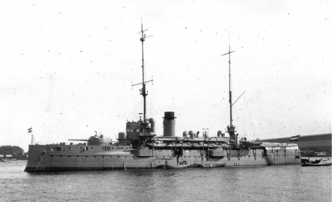 Launched 22 September 1906 and commissioned 22 April 1908. It had a long service history, saw action in World War II as a floating battery both for Netherlands and Germany. Then rebuilt into an accommodation ship after the war and decommissioned only on 13 September 1974. There was also the second vessel of the type, Marten Harpertzoon Tromp. The two were not exactly the same though. 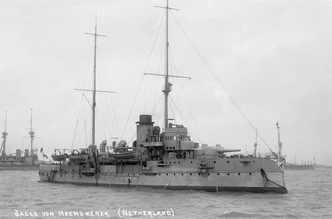 Jacob van Heemskerck was slightly smaller and had extra two 150-mm gun installed. 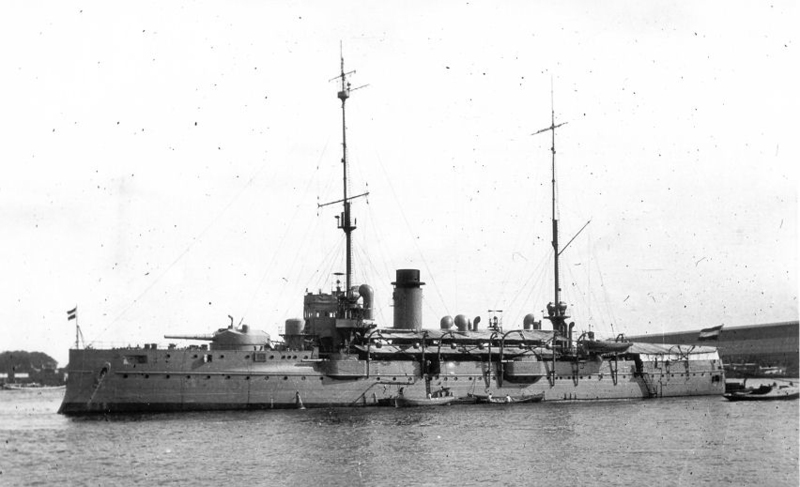 Both ships were of a quite unique type, specific to Royal Netherlands Navy. 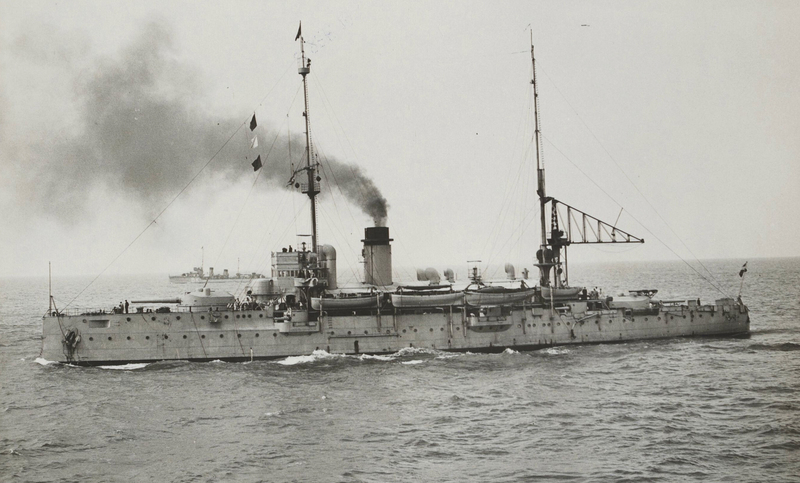 By 1900 Koninklijke Marine practically consisted of two parts, more or less distinct: one for protecting homeland and another mostly concerned with Dutch East Indies defence. Or, in other words, a branch for European affairs and a branch for handling overseas issues. Not only in Dutch East Indies, but also in other parts of the world, where Netherlands had its dominions. Like the Caribbean with Dutch-Venezuelan crisis of 1908 as an example: Jacob van Heemskerk and two protected cruisers, Gelderland and Friesland were employed to press Venezuela in course of the dispute, by blockading its ports. So Dutch pantserschips had to be fit for long missions in distant regions, crossing oceans and patrolling large areas in all weather conditions. That made them quite different from more typical coastal defence ships, like those of Sweden, Denmark, or Norway. Russian coastal defence vessels were once used for a similar task, but with much trouble and little success. As they were neither designed and built for such an endeavor, nor their crews were ever trained for it.